The monthly data reported yesterday, which so jarred the market, was apparent in the weekly data as the deterioration in coincident indicators intensified throughout the 4th quarter. So what is it doing now? To put a little perspective on today's economic news, remember that 3 of the 4 reports primarily reflect what is happening with producers, not consumers. It has been increasingly obvious for 3 months in the weekly data on shipping, steel production, and rail transport that this sector of the economy has gotten significantly worse. Yet the same weekly data has shown consumers holding up. Consumers represent about 70% of the economy. 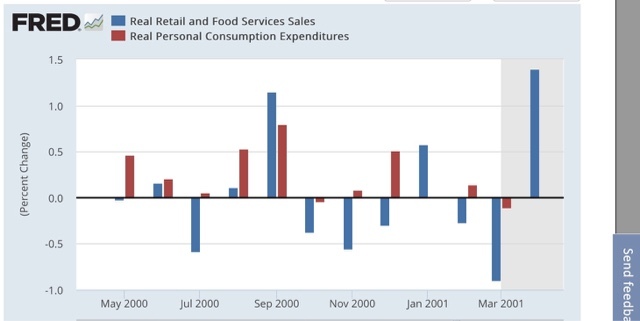 Nominal retail sales were down -0.1% in December. 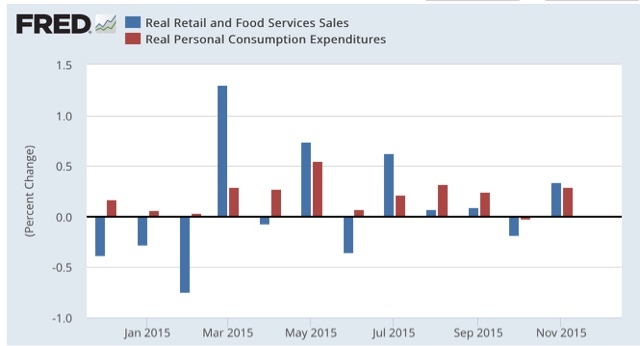 The Briefing.com consensus for CPI is also -0.1%, meaning that real retail sales are likely to be flat for the month. We have had much worse readings, including December 2014. Even with today's negative number, the comparison isn't nearly so bad. So today's numbers don't fundamentally change the dynamic. The industrial economy is awful. The consumer economy -- 70% of the total -- is meh, but positive. Today sees 4 important data releases: retail sales, producer prices, industrial production, and total business sales and inventory. 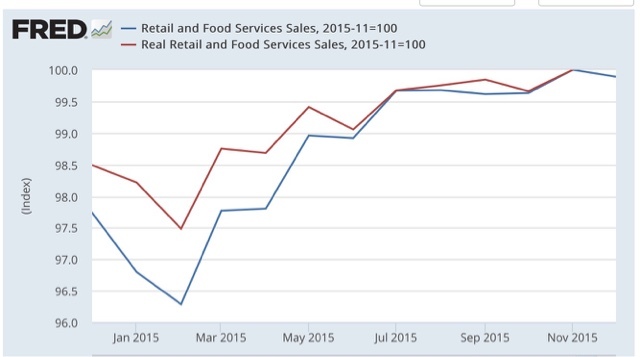 Retail sales, as expected after the punk December auto sales, were negative. 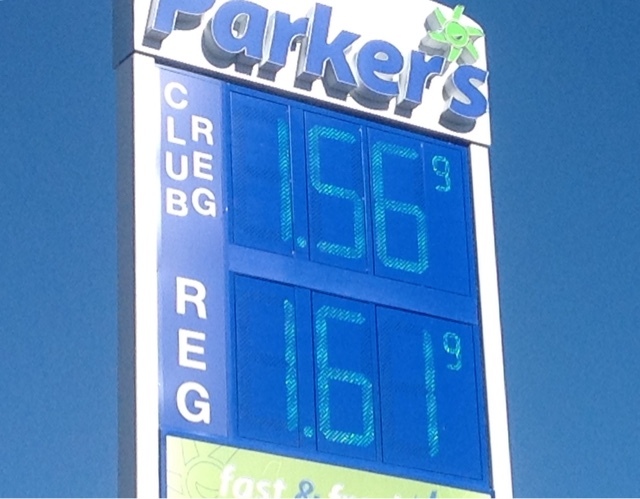 Aside from gas, clothing sales also declined (thank you global warming!). 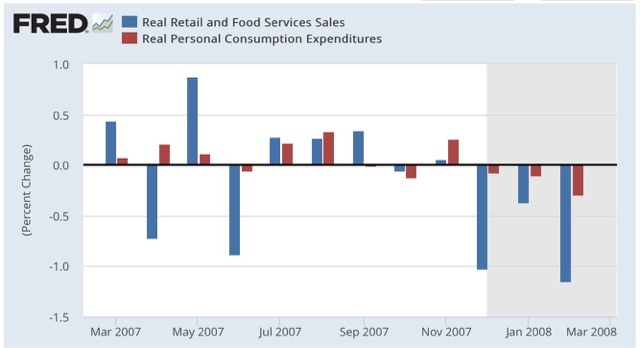 Unless the CPI is negative (which is possible), this means a real retail sales decline from November's post-recession high. Anything that suggests that the services sector is turning is soft is very unwelcome, but it is still only one month. Producer prices, on the other hand, were a slight positive in my reading. 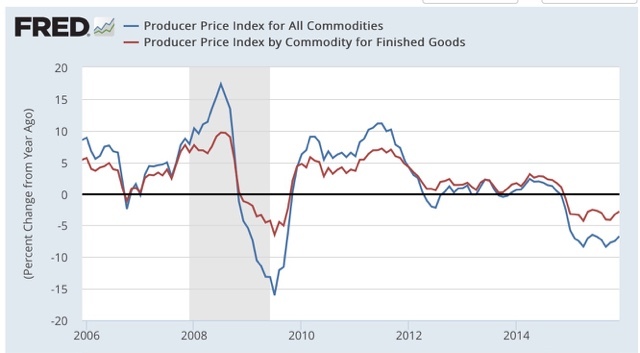 That's because deflationary busts end when YoY deflation bottoms - and we have 100 years of producer commodity prices in support of that argument, as I pointed out yesterday. We haven't broken out of the 2015 YoY range of declines, although relatively speaking this was the "least worst" reading in 6 months. perhaps slight evidence that the global slowdown might be in the process of bottoming. My template is the 2001 business led recession. 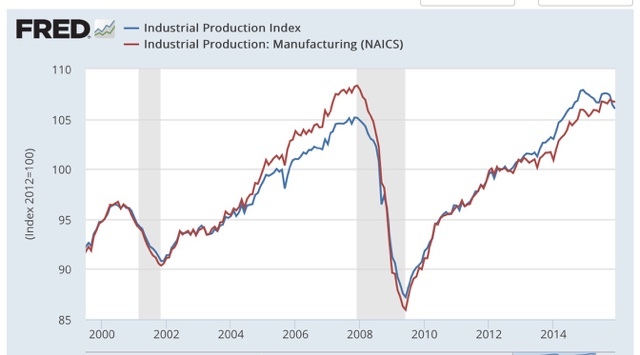 Industrial production as a whole is now down nearly as much as it was at the outset of that recession. 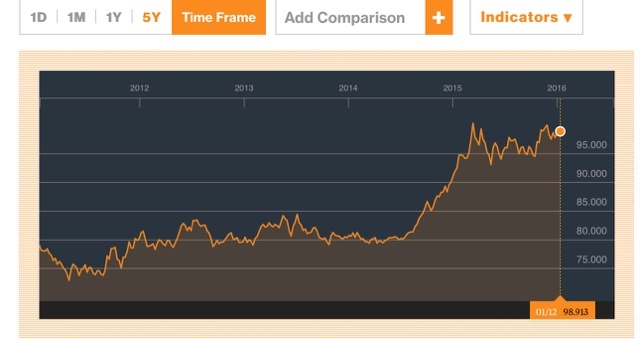 The silver lining is that it is almost all utilities and mining (oil!). This is not so much of a broad based downturn so much as a general stall and a horrendous downturn in specific sectors. 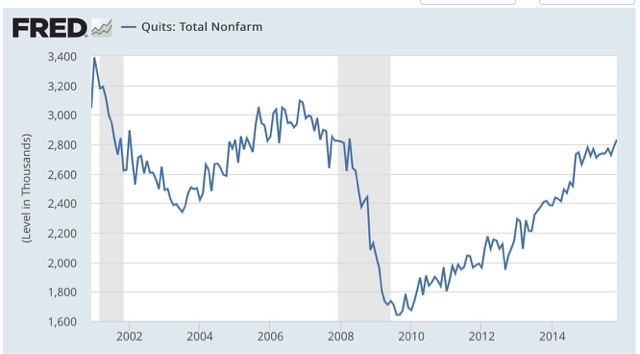 This may push Q4 GDP all the way to a negative number. 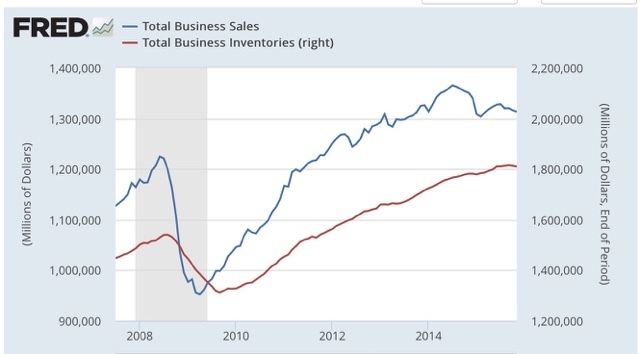 But we need excess inventories to be liquidated, and that is only going to happen if inventories go down. So this is telling us that we are beginning to actually work through the problem. Yesterday in my forecast for the first half of 2016 I wrote that the slowdown is probably going to bottom out by spring. But today's releases mean the *now*-cast is that the economy at the end of 2015 was a hairbreadth away from recession. This is up at XE.com . 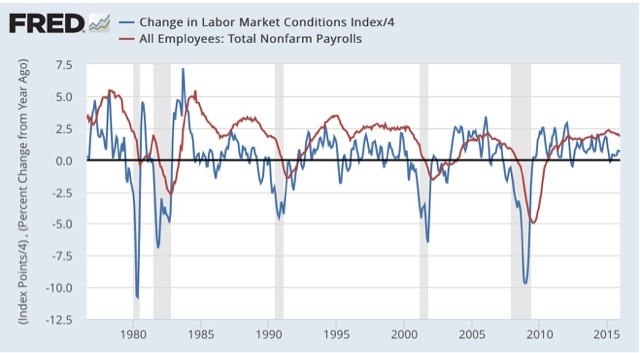 In the last few days, the Labor Market Conditions Index and JOLTs data have given us a more detailed look at the jobs market. This suggests to me to expect a marked slowdown in job growth in upcoming months -- at very least not so good as early 2015. But it also is not negative, and so not consistent with imminent recession. This does not suggest anything imminent. Note, I am discounting the 2001 spike at the far left, since we have no idea whether the data before that spike would have been higher or lower. Overall, this still looks like a late cycle slowdown, but not an actual contraction. Shame about their school systems and infrastructure though. 1. The Oil patch, and that portion of the industrial economy that is globally exposed, really really stink. They are in recession and it has deepened. 2. 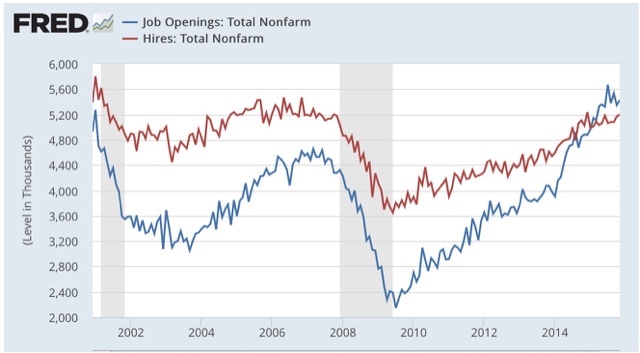 The services economy is doing OK. Despite the stock market breakdown, and the further decline in commodities, the US$ - responsible for all that badness in #1 above - has not broken out of its 2015 range (yet! ).